What techniques are the best for creating a mandala? How do I choose the right mandala template? Why should I come to Centrum Mandala? What does it have to offer? Why should I choose Centrum Mandala? It depends on your preference and on the format you will choose. We usually work with crayons (OMEGA our favorite ones from Koh-i-nor) which are suitable for small pictures. You can also get aquarelles. Aquarelle crayons are softer and easier to break, but you can dilute them with water and create an interesting effect. Another option is a progresa. Chalk is more suitable for larger formats. Working with watercolours or temperas is also interesting. However, wet techniques require heavier paper, a little bit more courage, and often more space as well. It is the best to try several techniques first and then choose the one you prefer the most. You can also come to us and test all the techniques before you invest in your own equipment. If you are only beginning with drawing, I recommend using crayons first and then you can gradually try other and possibly more interesting techniques. What can I do for feeling better? If you are not well it is because you are resisting yourself and you are not listening to your body. It is time to take more care of yourself. Start by dedicating at least a few minutes a day only to yourself. The easiest way is to choose a course which will provide you with a space for your needs. Choose your mandala templates based on which you like the best. There is a lot of templates on the market today and many of them can be downloaded from the internet. 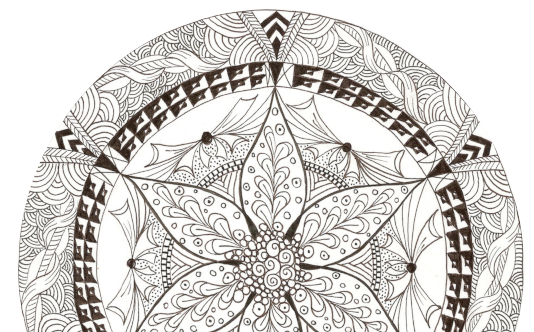 We have several mandalas on our web site as well. Some of them have descriptions of how and what you can use them for. Look at these notes only for inspiration. I believe that if you for example, try to communicate with an angel trough a mandala you dislike or which annoys you, rather than relaxes you, you will not be able to make any contact. On the other hand, you can also explore why the template does not feel right for you. Centrum Mandala is dedicated mostly to women. It offers you a space for self-realization and, unlike other similar centers, it does not give you any advice, interpretations or guidance for life. It is you yourself who will find the right way. Our wonderful tutors and lecturers will inspire you to an authentic experience of your true self and offer their own unique methods. We specialize in small group sessions in order to provide individual approach. In addition, we offer a refund in case we fail to meet your expectations.